THANK YOU FOR PURCHASING A NEW RRD KITE. Youâ&#x20AC;&#x2122;ve just chosen to purchase a kite with all the latest features and ultimate performance and special RRD design! Before using this kite for the first time, please read the users manual carefully. 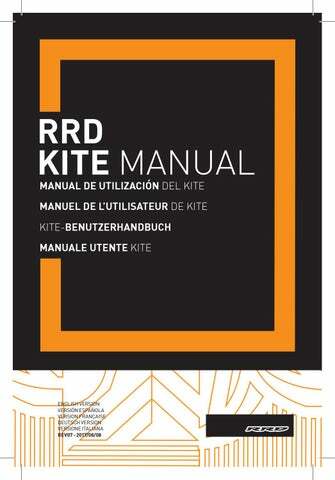 This manual is intended to educate you about your new RRD kite and provide you with information for the correct set-up, tuning, maintenance and care of the kite and its components. EXEMPTION AND ACCEPTANCE. Assignment of responsability, rejection of claims and awareness in acceptance of risks. ASSEMBLING THIS PRODUCT YOU UNDERTAKE TO: First of all to follow carefully terms and conditions set forth below, and second of all require anyone using this product to be bound by such terms. If you are unwilling to be bound by these terms, return this product (before use) for a full refund. A full refund will only be applied if this product has never been used. ASSUMPTION OF RISK. Use of this product and any of its components involves certain inherent risks, dangers and hazards, which can result in serious personal injury and death. In using this product you freely agree to assume and accept any and all known and unknown risks of injury while using this equipment. The risks inherent in the sport can be greatly reduced by abiding by the Warnings and Guidelines listed in this User’s Guide and by using common sense. any loss, damage, circumstantial, consequent, against the regulations or exemplary, or rather contractual, for injury or expense that you or any users of your RRD Product may suffer, or that your next of kind may suffer, as a result of the use of the RRD Product, due to any cause whatsoever, including negligence or breach of contract on the part of RRD and all related parties in the design or manufacture of the RRD Product and any of its components. In the event of your death or incapacity, all provisions contained herein shall be effective and binding upon your heirs, next of kind, executors, administrators, assigns, and representatives. RRD-related parties have not made and expressly deny any oral or written representations other than what is set forth herein and the RRD Product User’s Manual. ASSUMPTION OF RISK. The use of this RRD Product and any of its components involves certain inherent risks, dangers, and hazards, ineluctable and unpredictable, which can result in serious personal injury and death to both the user and to non user third parties. In using this RRD Product, you freely agree to assume and accept any and all known and unknown risks of injury to you and to third parties while using this equipment. Kiteboarding is a dangerous sport and the use of kiteboarding equipment can result in serious personal injury and death to both the user and to non user third parties. The risks inherent in this sport can be greatly reduced by abiding by the warning guidelines listed in this owner manual and by using common sense. RELEASE AND WAIVER OF CLAIMS. Purchasing and using this RRD products, you hereby fully agree to the following details: â&#x20AC;˘ Explicit waiver of any and all claims that you have or could have in the future against Ricci International Srl, for any and all damages incurred as a result from use of this RRD Product and any of its components. â&#x20AC;˘ Under no circumstances Ricci International Srl can be responsible for any and all liability for any loss, damage, injury or expense that you or any users of your RRD Product may suffer, as a result of the use of the RRD Product, and any of its related components. Due to any cause whatsoever, including negligence or breach of contract on the part of RRD and all related parties in the design or manufacture of the RRD Product and any of its components. In the event of your death or incapacity to understand and will, all provisions contained herein shall be effective. READ THE FOLLOWING POINTS BEFORE ASSEMBLING YOUR NEW RRD KITE. Warnings: • Kite flying can be dangerous. • Always use extreme caution when using this product. • Misuse of this product can cause serious injury or death. • Only use this product if you are in good physical health. • Your kite is not a personal flotation device. Never act in a careless manner when using this product (such as jumping in the air, or tying yourself down to objects or structures). You are responsible for your own safety, and the safety of others around you when using this product. • This product is not a personal flotation device. sh system. Quick Release devices have a limited lifetime, must be checked at the end of each session and changed as soon as first signals of wear and tear become evident, in order to always guarantee the best efficiency. • Always wear a Coast Guard approved personal flotation device when using this product near the water. • Always have a partner when launching and landing your kite. ting. Change them before if you see any sign of wear. The wearing of your Quick Release devices is not considered a warranty issue. CHOOSE SAFE WEATHER CONDITIONS. •	Never learn to use this product in more than 10 knots of wind. •	Never use this product in high or gusty winds. •	Never use this product in thunderstorm and lightning conditions. •	Only use this product when you can remain in a standing position. •	Never use this product in wind conditions that are beyond your ability level. •	Never use this product near or on the water in offshore wind conditions unless you are an expert swimmer. WARNINGS AND IMPORTANT SAFETY RULES. CHOOSE A SAFE LOCATION. •	Always observe local rules and regulations when using this product. •	Never use this product near power lines, telephone poles, trees, bushes, roads, automobiles, or airports. •	Only use this product when you have 100 meters of clear space downwind, and on both sides of your launching position. The power of the kite can pull you downwind unexpectedly and with great force. •	Do not fly your kite over other people or pets. Spectators should remain upwind of you when using this product. •	Never use this product on crowded beaches or fields. •	Never use this product near the water unless you know how to swim and are in good physical health. •	Practice launching and landing procedures, and self rescue techniques before using this product near the water. Use caution with the flying lines. •	Never touch the flying lines when the kite is in use. Flying lines are extremely dangerous while under tension and can cause serious injury or death. •	Never use this product with worn lines. A line that breaks while under tension can cause serious injury or death. •	Always check your flying lines for knots before each use. Knots greatly reduce the strength of the lines. •	Stay away from tangled flying lines unless the kite is secured to the ground. An unsecured kite can self launch unexpectedly, and can cause serious injury or death. •	Never allow yourself, or anyone else, to get between the control bar and the kite when using this product(s). ADJUSTING THE POWER OF YOUR KITE WITH THE CLAM CLEAT. Pulling on the black handle will shorten your front lines and the kite will have less power. Releasing the black handle will give you more power. INFLATING: •	Always use the pump leash to hold your kite while you inflate. •	Single Pump System is standard on all RRD Kites. •	Pump until the kite is very firm and rigid (max 10 psi). •	Cover the inflate valve with the Velcro. After landing and securing your kite, detach your lines and wind them up. Leaving lines on the ground can be hazardous. NOTE: • Never store a kite if WET. If you fold a wet kite you risk to have a color run on different colors of the materials of your kite. Color runs on any RRD Kites will not be covered by warranty, since it’s only due to neglecting this point. • Let it dry and remove excess sand from the kite before rolling it up. Carefully folding the kite is very important to extend the life of the kite and to prevent twisting the leading edge bladder. Before folding your kite, dry it out completely. TO FOLD THE KITE: 1) Open both valves on the leading edge - deflate valve and inflate valve - to fully deflate air from the main bladder; 2) Lay the kite flat on the ground and flatten the leading edge; 3) Start folding the kite at the wingtip towards the center making sure that the leading edge stays flat; 4) Fold both sides together; 5) Fold the kite into three sections. HOW TO DEFLATE YOUR KITE WITH SPS SYSTEM: Open the dump valve on the LE. That’s it!!! INFLATION PRESSURE: •	Pressure is really important, pump until the kite is very firm and rigid (max 10 psi). •	Don’t leave the kite exposed to direct sunlight. • Never leave an inflated leading edge on a hot spot. NOTES ON KITE. Pulleys - Make sure that all the pulleys are in good working order before each session. Rinse them with fresh water after each session to keep them sand and debris free. Sun - Ultraviolet radiation is the enemy of all fabrics. Your kite will last a long time in even the most extreme sun, but care should be given not to subject the kite to unnecessary exposure. For instance; If you have more than one kite rigged on the beach, put the one you are not using in the shade. Heat - Bladder pressure increases when the air inside gets hot. Be careful of kites left on dark surfaces (black sand, asphalt) as the pressure in the bladders may cause damage to the kite. Don’t leave struts fully inflated inside a hot car. Sand - Try to keep sand from sitting in the crease between the inflated frame and the canopy. Sand left here will act as a constant source of abrasion. Rocks - Rocks, coral, sticks and other beach debris are potential puncture hazards for any kite Bladder - Keep sand and water out of the internal bladders. If deflating the kite on the water, close valve afterwards. Storing - The combination of a kite stored while still wet and heat can cause colours to transfer. Only pack your kite away after it is completely dry. WARNING: THIS PROBLEM IS NOT COVERED BY WARRANTY Pump - Apply even pressure on both sides of the pump handle to decrease the possibility of handle failure. Self-launch - Use caution when self-launching in windy conditions, as this puts a lot of strain on the leading edge. Leading edge - Do not allow the leading edge to bend backwards. Use care when handling on the beach during launching or landing to keep the leading edge in its proper “C” shape. The kite is not designed to be bent backwards. Straightening or bending the leading edge backwards puts tremendous strain on the fabric. Shore break - Even a small shore break can be brutal on a kite. Not only does the shorebreak carry sand into every crevice on the kite, but moving water can rip the kite skin. Miscellaneous - Impact zones, shore breaks, power lines and trees are even dangerous. CORRECT USE OF THE INFLTAING/DEFLATING VALVE. After inflating the kites, make sure the bottom section of the valve is well tightened. Always cover the valve, both when the kite is inflated and also when itâ&#x20AC;&#x2122;s deflated and folded into its bag. When the kite is folded, make sure to NEVER let the valve unscrewed and/or without the neoprene cover. Leaving the valve unscrewed and not covered will DAMAGE kite fabric and the valve itself. SPS /SINGLE PUMP SYSTEM CONNECTION. 1 - Pull the transparent connector through the SPS hole on the dacron fabric surface, making sure to keep the air bladder inside the leading edge (or strut) in a correct position, avoiding twists. 2 - Pull the transparent connector towards the oustide until its base will be perfectly locked in place around the SPS hole onto the dacron fabric surface. 3 - Place the yellow soft rubber ( silicon rubber) cap around the soft rubber tube, making sure that the tube reaches the correct position shown in the photo. 4 - In order to help inserting the tube around the transparent connector, you can use a small drop of water as lubrication . While inserting the tube around the transparent connector, make sure to insert it well and all the way to the end. 5 - Push firmly the tube and the yellow cap above the transparent connector, making sure the tube will not slide back compared to the original position inside the yellow cap. 6 - Once you have placed the yellow cap properly on top and around the transparent connector, push firmly on the yellow cap making sure its locked around its specific groove on the transparent connector , as shown in the photo. Ricci International Srl warrants this product to be free of major defects in material or workmanship to the original purchaser, for a period of twelve (12) months (24 EU) from the date of purchase. Srl components, damage due to excessive sun exposure, or damage due to over inflation of the bladders, damage caused by improper handling and storage, damage caused by use in waves or shore break, and damage caused by anything other than defects in material and workmanship. This warranty is voided if any unauthorized repair, change or modification has been made to any part of the equipment. The warranty for any repaired or replaced equipment is good from the date of original purchase only. The original purchase receipt must accompany all warranty claims. The name of the retailer and date of purchase must be clear and legible. There are no warranties, which extend beyond the warranty specified here in. Warranty Claims. Warranty claims must be processed and be issued a return authorization prior to shipping to RRD International Srl. Please call or write for claims processing to the national Ricci International Srl distributor or and than forward to Ricci International Srl. to request to local distributor. GRACIAS POR ADQUIRIR UN NUEVO KITE DE RRD. Acaba de adquirir una cometa RRD que posee los últimos avances en diseño y tecnología! Antes de utilizar esta cometa por primera vez, le recomendamos leer el manual de uso con atención. Este manual tratará de instruirle sobre su nueva cometa RRD y aportarle información para el correcto montaje, personalización, mantenimiento y cuidado de la cometa y sus componentes. EXENCIÓN DE RESPONSABILIDAD Y ACEPTACIÓN. Asunción de responsabilidad, tramitación de reclamaciones y aceptación de responsabilidad y riesgos. MONTANDO ESTE PRODUCTO, USTED SE COMPROMETE A: En primer lugar, debe seguir con atención las instrucciones y condiciones expuestas a continuación, en segundo lugar cualquier persona que utilice este producto queda obligado en los siguientes términos. Si no esta dispuesto a quedar obligado en estos términos devuelva el producto antes de su uso, para total devolución. La completa devolución solamente ser aplicará si el producto no a sido utilizado. ASUNCIÓN DE RIESGOS. El uso de este producto y cualquiera de sus componentes supone la asunción de determinados riesgos inherentes al mismo, daños y perjuicios. Los cuales pueden producir daños personales, incluso la muerte. Usando este producto está totalmente de acuerdo en asumir y aceptar cualquier riesgo de lesión conocido o desconocido causado por este equipo. Los riesgos inherentes a este deporte pueden reducirse siguiendo el manual de uso y utilizando el sentido común. del producto o de cualquiera de sus componentes. • Bajo ninguna circunstancia Ricci International Srl y/o cualquiera de sus agentes y todo lo con el relacionado pueden ser responsables por causa de perdida, daño circunstancial, en consecuencia, contra la regulación o modelo de tipo contractual por, lesiones o gastos que usted o cualquier usuario de productos RRD pueda sufrir en lo sucesivo con el uso del producto RRD debido a cualquier causa, incluyendo negligencia o rotura de contrato por parte de RRD y todas las partes relacionadas con el diseño o manufactura de los productos RRD o cualesquiera de sus componentes. En el caso de fallecimiento o caducidad, todas las previsiones contenidas aquí serán vinculantes incluso para sus herederos o sucesores. RRD-partes relacionadas no han hecho y expresamente rechazan cualquier representante oral o escrito del que se expone en el manual de uso de los productos RRD. ASUNCIÓN DE RIESGO. El uso de los productos RRD y cualesquiera de sus componentes supone la asunción de riesgos ciertos y posibles perjuicios, esperados o inesperados, que pueden producir como resultado daños personales a usuarios o a terceros, usando los productos RRD asume plenamente y acepta todos los riesgos de lesión conocida o desconocida que pueda producirse a usted mismo o a terceros. El Kiteboarding es un deporte peligroso y el uso de equipos de kiteboarding pueden producir un daño personal, tanto al usuario como a terceros. El riesgo inherente a este deporte pude reducirse siguiendo el manual de instrucciones y utilizando el sentido común. ASUNCIÓN Y RENUNCIA DE RECLAMACIONES. Usando los productos RRD usted está de acuerdo en lo siguiente: • Renuncias expresas y otras quejas que pueda tener, o tenga en el futuro, contra Ricci International Srl, por cualquier daño ocurrido como resultado de uso de los productos RRD o cualquiera de sus componentes. • Bajo ninguna circunstancia Ricci Internacional Srl se hace responsable por perdida, lesión, daño o gasto en que puede incurrir como usuario de los productos de RRD o cualquiera de sus componentes, debido a cualquier causa, negligencia o ruptura de contrato por parte de RRD y las partes relacionadas con el diseño o manufactura de productos de RRD o cualesquiera de sus componentes. En caso de muerte o incapacidad para entender y comprender, todas las previsiones contenidas aquí se harán efectivas. LEA LOS SIGUIENTES PUNTOS ANTES DE MONTAR SU NUEVA COMETA RRD. Precauciones: • Volar la cometa puede ser peligroso. • Utilice siempre extrema precaución al usar este producto. • El mal uso de este producto puede causar serios daños o incluso la muerte. • Use este producto únicamente si está en buena condición física. • Su cometa no es un dispositivo de flotación personal. No actúe de manera imprudente usando este producto (tales como saltar en el aire o amarrarse con objetos o estructuras). Es responsable de su propia seguridad y de la de los que le rodean mientras está usando este producto. un accesorio permanente en este producto. Nunca se ate de forma permanente a su cometa o a cualesquiera de sus componentes. • Siempre utilice casco, guantes, escarpines y gafas de protección cuando utilice este producto. • Siempre utilice un arnés especifico y de alta calidad. • Antes de usar este producto tome lecciones en una reputada escuela. Y no intente volar una cometa sin haber sido debidamente instruido por un monitor cualificado. • Acostúmbrese al funcionamiento de su “suelta rápida” probándolo antes de una situación de emergencia. • Después de cada sesión limpie su material con agua dulce: 1)Suelta rápida; 2)Sistema de frenado; 3) El leash de seguridad; 4) Leash System. El sistema de suelta rápida tiene una vida limitada y tiene que ser comprobado después de cada sesión y cambiado en cuanto aparezcan las primeras evidencias de desgaste, con la finalidad de garantizar la mayor eficiencia. • El sistema de suelta rápida, la argolla de trimado y su equipo de leash con suelta rápida deben ser cambiados después de 250 horas de uso. Cámbielo, incluso antes, si observa alguna señal de desgaste. El desgaste de su sistema de suelta rápida no está cubierto por la garantía. ELEGIR SIEMPRE BUENAS CONDICIONES METEOROLÓGICAS. •	Nunca aprenda a usar este producto con más de 10 nudos de viento. •	Nunca use este producto con viento fuerte o racheado. •	Nunca use este producto en caso de tormenta eléctrica. •	Solo use este producto cuando pueda permanecer en una posición fija. •	Nunca use este producto en condiciones de viento por encima de su nivel de habilidad. •	Nunca use este producto cerca o sobre el agua en condiciones de viento de tierra si no es un experto nadador. na forma física. •	Practique el proceso de levantamiento y aterrizaje, así como las técnicas de auto rescate, antes de utilizar este producto en el agua. UTILICE CON PRECAUCIÓN LAS LÍNEAS. •	Nunca toque las líneas de la cometa cuando esta esté volando. Las líneas de la cometa son extremadamente peligrosas cuando están en tensión y pueden causar serias lesiones o incluso la muerte. •	Nunca use este producto con las líneas desgastadas. Una línea puede romperse en situación de tensión causando serios daños o incluso la muerte. •	Siempre revise las líneas de potencia y asegúrese de que estén libres de nudos antes de cada uso. Los nudos reducen extremadamente la fuerza de las líneas. •	Siempre permanezca alejado de líneas enredadas a no ser que la cometa esté segura sobre el suelo. Una cometa colocada sin la debida seguridad puede despegar inesperadamente y causar serias lesiones o incluso la muerte. •	Nunca se coloque entre las líneas y la barra de la cometa ni permita que otros lo hagan mientras se esté utilizando. AJUSTE LA POTENCIA DE SU COMETA CON EL CLAM CLEAT. Tirando del asa negra acortará las líneas frontales y la cometa tendrá menos potencia. Alargando el asa negra conseguirá mayor potencia. HINCHADO: •	Utilize siempre el leash de la cometa cuando la hinche. •	El sistema de “Single Pump System” es estándar en todas las cometas RRD. •	Hinche la cometa hasta que esta quede muy rígida (max 10 psi). •	Cubra la válvula de hinchado con el velcro protector. Tras un aterrizaje seguro de su cometa, desconecte las líneas y enróllelas. Dejar las líneas sueltas en el suelo puede ser peligroso. NOTA: • Nunca guarde una cometa si está mojada. Si pliega una cometa mojada corre el riesgo de que haya corrimientos de color en otras parte de la cometa de los diferentes materiales. Los desteñidos del color de las cometas RRD no serán cubiertos por la garantía, ya que solo es debido al incumplimiento de este punto. • Déjelo secar y quite el exceso de arena antes de enrollar la cometa. Tenga cuidado al enrollar la cometa, es muy importante para alargar la vida de la misma y prevenir giros de tubo del borde de ataque. Antes de enrollarlo, séquelo completamente. ENROLLADO DE LA COMETA: 1) Abra la válvula de deshinchado de la cometa, para vaciar por completo el tubo del borde de ataque; 2) Coloque la cometa totalmente plana en el suelo y aplane el borde de ataque; 3) Empiece a enrollar la cometa desde las puntas hacia el centro asegurándose de que la cometa se encuentra totalmente plana; 4) Coloque ambas partes juntas; 5) Doble la cometa en tres secciones. CÓMO DESHINCHAR SU COMETA CON EL SISTEMA SPS: Abra la válvula de vaciado en el borde de ataque de la cometa. ¡Eso es todo! INFLATION PRESSURE: •	La presión es muy importante, hinche la cometa hasta que esta esté firme y rígida (max 10 psi). •	No deje la cometa expuesta directamente a la luz del sol. • Nunca deje un borde de ataque hinchado sobre una superficie caliente. NOTAS SOBRE EL CUIDADO DE LA COMETA. Poleas - Asegúrese de que las poleas se encuentran en buen estado de conservación antes de cada sesión. Endúlcelas con agua dulce después de cada sesión para mantenerlas limpias de arena y suciedad. Sol - La radiación ultravioleta es la enemiga de todas las telas. Su cometa durará mucho tiempo, incluso bajo el sol más extremo, pero debe tener cuidado de no someterla a una exposición innecesaria. Por ejemplo; si tiene más de una cometa montada en la playa, coloque la que no use en la sombra. Calor - La presión del tubo del borde de ataque sube cuando se calienta. Tenga cuidado de las cometas colocadas sobre superficies (arena negra, asfalto) pues la presión de los tubos puede causar daños en su cometa. No deje las costillas hinchadas a máxima presión dentro de un coche expuesto al sol. Arena - Trate de mantener siempre limpio de arena la zona entre el pliegue de hinchado y el capuchón. La arena depositada aquí hará un continuo acto de abrasión. Rocas - Las rocas, corales, palos y otros escombros de la playa son un peligro constante para su cometa. Tubos - Mantenga los tubos hinchables limpios de arena y agua. Si tiene que deshinchar la cometa en el agua, asegúrese de cerrar luego la válvula. Guardado - El empaquetado de una cometa cuando todavía está mojada junto al calor puede causar corrimientos del color. Guarde su cometa cuando esté totalmente seca. PRECAUCION: ESTE PROBLEMA NO ESTÁ CUBIERTO POR GARANTÍA Bomba de hinchado - Aplique presión en ambos lados de la bomba con las dos manos para disminuir la posibilidad de ruptura. Auto-levantamiento - Tenga cuidado cuando levante la cometa usted solo en la arena pues eso puede ejercer mucha tensión sobre el borde de ataque. Borde de ataque - Nunca permita que el borde de ataque se doble del revés. Tenga cuidado cuando levante o baje la cometa en la arena, manteniendo siempre la forma “C”. La cometa no está diseñada para doblarse hacia atrás o del revés. Rompientes orilleras - Incluso una pequeña orillera puede ejercer una presión excesiva sobre la cometa. Las rompientes ponen arena en todas las hendiduras y el movimiento de agua puede romper la tela de la cometa. Varios - Onas de impacto, orilleras, líneas de alta tensión y arboles son también peligrosos. USO CORRECTO DE LA VÁLVULA DE HINCHADO/ DESHINCHADO. Después de hinchar la cometa, asegúrese de que la parte baja de la sección de la válvula está bien ajustada. Cubra la válvula, tanto cuando la cometa está hinchada como deshinchada y guárdela en la bolsa. Cuando la cometa está plegada, asegúrese de que NUNCA deja la válvula desenroscada y/o sin el capuchón de neopreno. Dejar la válvula desenroscada y sin cubrir puede DAÑAR la tela de la cometa o la propia válvula. CONEXIÓN SPS. 1 - 1 - Tire del conector transparente hacia fuera de la superficie de dacron, asegúrese de mantener la válvula dentro del borde de ataque en la posición correcta, evitando girarla. 2 - Tire del conector transparente hacia fuera hasta que su base quede perfectamente localizada en el lugar delimitado por el agujero SPS en la superficie de dacron. 3 - Coloque la pieza amarilla de caucho blando en el extremo del tubo de goma, asegúrese que el tubo está en posición correcta como muestra la fotografía. 4 - Para ayudar a meter el tubo en el conector transparente, puede utilizar unas gotas de agua como lubricante. Cuando esté insertando el tubo en el conector transparente asegúrese de que lo hace en la posición correcta y hasta el final. 5 - Una firmemente el tubo con la pieza amarilla con el conector transparente, asegurándose de que el tubo no se deslice de su posición original de la pieza amarilla. 6 - Una vez que haya colocado apropiadamente la tapa amarilla sobre el conector transparente, presione firmemente dicha tapa amarilla asegurándose de que está situada en su ranura especifica sobre el conector transparente como muestra la fotografía. Ricci Internacional Srl garantiza que este producto está libre de cualquier tipo de defecto de material o mano de obra del fabricante original por un periodo de 12 meses o (24EU) desde la fecha de fabricación. Esta garantía está sujeta a las siguientes limitaciones. Esta garantía es validad solo si conserva la factura o ticket de compra que muestre claramente la fecha de fabricación. Esta garantía solo es valida cuando el producto es usado para kiteboarding en agua, y no cubre los productos que hayan sido usados para alquiler y escuelas. Ricci Internacional Srl se reserva la determinación del alcance de la garantía. Ricci Internacional Srl demanda la siguiente información en procesos de garantía: • Foto de la zona dañada; • Foto del número de serie; • Copia de la factura o ticket de compra. Aporte toda la información a su vendedor o distribuidor que contactará con Ricci Internacional Srl. No se admiten las reclamaciones directas. Los productos pueden ser devueltos solo si el numero de autorización de devolución (RA) es facilitado por Ricci Internacional Srl con anterioridad. El número de (RA) debe estar claramente etiquetado en el embalaje o, en caso contrario será rechazado. Si algún producto se considera defectuoso por Ricci Internacional Srl, la garantía cubre únicamente la reparación o sustitución del producto defectuoso. Ricci Internacional Srl, no se hace responsable por cualquier coste, perdida o daño ocurrido como resultado de la perdida de uso del producto. Esta garantía no cubre los daños causados por el mal uso, abuso, negligencia o el desgaste derivado del normal uso, y se limita por la combinación con componentes distintos a los de Ricci Internacional Srl, por daños derivados de una exposición excesiva al sol, o daños de sobre hinchado del los tubos, daños causados por un trimado incorrecto, daños causados por olas o rompientes orilleras, y daños causados por cualquier otro defecto de material o mano factura. Esta garantía queda anulada si se realiza una modificación o cambio no autorizado. La garantía para la reparación o reemplazo del equipo es valida únicamente desde la fecha original de la compra. El recibo de la compra debe acompañar a las reclamaciones de garantía. El nombre del vendedor y de la fecha de compra tienen que ser claras y legibles. No habrá garantías que no reúnan los requisitos aquí especificados. Reclamaciones de Garantía. Las reclamaciones de garantía deben ser procesadas y devueltas antes del envío del material a RRD Internacional Srl. Por favor llame o escriba, para los procesos de reclamación, a su distribuidor nacional o directamente a Ricci Internacional Srl. facilitado por tu tienda local. MERCI POUR AVOIR ACHETÉ UN KITE RRD. Vous venez de choisir d’acheter un Kite totalement génial avec toutes les dernières fonctionnalités et des performances ultimes, Merci à l’équipe de conception unique RRD ! Avant d’utiliser ce kite pour la première fois, merci de lire attentivement le manuel de l’utilisateur. Ce manuel est destiné à vous familiariser avec votre nouveau kite RRD et vous fournir des informations pour un montage correct, le réglage, la maintenance et l’entretien de l’aile et de ses composants. EXEMPTION ET ACCEPTATION. Limite de responsabilité, rejet de réclamation et sensibilisation dans l’acceptation des risques. A L’ASSEMBLAGE DE CE PRODUIT VOUS VOUS ENGAGEZ À: Tout d’abord de suivre attentivement les termes et conditions stipulées ci-dessous, et en second lieu exiger de quiconque utilisant ce produit à reconnaître ces termes. Si vous ne voulez pas être lié par ces termes, retournez le produit (avant de l’utiliser) afin d’être totalement remboursé. Un remboursement complet ne sera appliqué que si ce produit n’a jamais été utilisé. L’utilisation de ce produit et de ses composantes comporte certains risques et dangers inhérents, ce qui peut entraîner des blessures graves et des décès. En utilisant ce produit vous acceptez d’assumer librement et d’accepter tous risques connus et inconnus de blessure lors de l’utilisation de cet équipement. Les risques inhérents à ce sport peuvent être considérablement réduits en respectant les avertissements et conseils énumérés dans ce guide de l’utilisateur et en faisant preuve de bon sens. vous avez ou pourriez avoir à l’avenir contre Ricci International Srl, ou de ses agents et de toutes parties liées résultant de l’utilisation de ce produit et d’un de ses composants. • En aucun cas, Ricci International Srl et / ou un de ses agents et toutes les parties liées peuvent être responsables de toute responsabilité pour toute perte, dommage, circonstancielle, conséquences, contre les règlements ou préjudices, ou plutôt contractuelles, en cas de blessure ou dépense que vous ou tout utilisateur de votre produit RRD peuvent souffrir ,ou que vos enfants peuvent souffrir, en raison de l’utilisation du produit RRD, pour quelque cause que ce soit, y compris la négligence ou rupture de contrat de la part de RRD et de toutes les parties liées à la conception ou la fabrication du produit RRD et un de ses composants. En cas de décès ou d’incapacité, toutes les dispositions contenues ici sont applicables et lie vos héritiers, vos descendants, exécuteurs, administrateurs, ayants droit, et vos représentants. RRD et les parties liées à RRD rejetons expressément toutes observations orales ou par écrit autres que ce qui est énoncé ici ainsi que dans le m nuel de l’utilisateur de produit RRD. L’utilisation de ce produit RRD et un de ses composants comporte certains risques inhérents, et les dangers, inéluctable et imprévisible, qui peuvent entraîner des blessures graves et des décès à la fois pour l’utilisateur et à des tiers parties non utilisateur. En utilisant ce produit RRD, vous acceptez d’assumer librement et d’accepter tout et tous risques connus et inconnus de blessures à vous et à des tiers lors de l’utilisation de cet équipement. Le kite est un sport dangereux et l’utilisation d’équipements de kite peut entraîner des blessures graves et des décès à la fois pour l’utilisateur et à des tiers non utilisateur. Les risques inhérents à ce sport peuvent être considérablement réduits en respectant les lignes d’avertissement figurant dans ce manuel du propriétaire et en faisant preuve de bon sens. DÉSENGAGEMENT ET RENONCIATION À TOUS RECOURS. Par l’achat et l’utilisation de ces produits RRD, vous acceptez pleinement les informations suivantes: • Renonciation expresse de toutes les réclamations que vous pouvez ou pourraient avoir à l’avenir contre Ricci International Srl, pour tous les dommages encourus à la suite de l’utilisation de ce produit RRD et un de ses composants. • En aucun cas, Ricci International Srl peut être tenu responsable de toute responsabilité pour toute perte, dommages, blessures ou dépenses que vous ou tout utilisateur de votre produit RRD peuvent souffrir, à la suite de l’utilisation du produit RRD, et l’un de ses des composants connexes. Pour quelque cause que ce soit, y compris la négligence ou rupture de contrat de la part de RRD et toutes les parties liées à la conception ou la fabrication du produit RRD et un de ses composants. Dans le cas de votre décès ou de votre incapacité à comprendre et agir, toutes les dispositions contenues dans la présente seront appliquées. LIRE LES POINTS SUIVANTS AVANT LE MONTAGE DE VOTRE NOUVELLE AILE RRD. Avertissements: • Le kite peut être dangereux. • Toujours utiliser une extrême prudence en utilisant ce produit. • La mauvaise utilisation de ce produit peut causer des blessures graves ou un décès. • Utilisez ce produit seulement si vous êtes en bonne santé physique. •Votre kite n’est pas un vêtement de flottaison individuel. Ne jamais agir d’une manière négligente en utilisant ce produit (comme sauter dans les airs, ou s’attacher à des objets ou des structures) • Vous êtes responsable de votre propre sécurité, et de la sécurité des autres autour de vous lors de l’utilisation de ce produit. un attachement permanent à ce produit. Ne vous attachez pas de façon permanente à l’aile ou à un de ses composants. Lisez les points suivants avant de monter vos nouveau kite RRD. • Portez toujours un casque, des gants, des chaussures et des lunettes de protection lors de l’utilisation de ce produit. • Toujours utiliser un harnais spécifiques de kite d’une grande qualité. • Avant d’utiliser ce produit prendre des leçons dans une école réputée. Ne pas tenter de faire voler un kite sans être formés par un instructeur de kite. • Familiarisez vous avec la façon dont fonctionne le system de déclenchement rapide en le testant souvent dans une situation non urgente. • Après chaque session rincer ces dispositifs dans l’eau douce: 1) le system à déclenchement rapide, 2) La boucle de réglage de la puissance; 3) le leash de sécurité; 4) le système du leash Les dispositifs à déclenchent rapide ont une durée de vie limitée, ils doivent être vérifié à la fin de chaque session et changé dès que des premiers signes d’usure sont évident, afin de toujours garantir la meilleure efficacité. • Le déclenchement rapide, la boucle de réglage et votre leash équipé d’un déclenchement rapide doivent être changé après 250 heures de kite. Changez-les avant si vous voyez des signes d’usure. Le port de vos équipements à déclenchement rapide n’est pas considéré comme un problème de garantie. CHOISISSEZ DES CONDITIONS MÉTÉOROLOGIQUES SÉCURISANTES. • Ne jamais apprendre à utiliser ce produit dans plus de 10 nœuds de vent. • Ne jamais utiliser ce produit dans des vents violents ou en rafales. • Ne jamais utiliser ce produit dans une tempête et des conditions avec de la foudre. • Utilisez ce produit seulement lorsque vous pouvez rester en position debout. • Ne jamais utiliser ce produit dans des conditions de vent qui sont audelà de votre niveau. • Ne jamais utiliser ce produit à proximité ou sur l’eau dans des conditions de vent de terre (offshore) sauf si vous êtes un excellent nageur. AVERTISSEMENTS ET RÈGLES DE SÉCURITÉ IMPORTANTES. CHOISIR UN ENDROIT SÛR. • Observez toujours les règles et règlements locaux en utilisant ce produit. • Ne jamais utiliser ce produit près des lignes électriques, poteaux téléphoniques, des arbres, des buissons, des routes, des automobiles ou des aéroports. • Utilisez ce produit seulement quand vous avez 100 mètres sous le vent d’espace libre, et des deux côtés de votre position de lancement. La puissance de l’aile peut vous tirer sous le vent de façon inattendue et avec beaucoup de force. • Ne faites pas voler votre Kite au dessus d’autres personnes ou des animaux. Les spectateurs doivent rester à votre vent quand vous utilisez ce produit. • Ne jamais utiliser ce produit sur des plages ou des zones surpeuplées. • Ne jamais utiliser ce produit près de l’eau si vous ne savez pas nager et n’êtes pas en bonne santé physique. • Entrainez vous aux procédures de lancement et d’atterrissage et aux techniques de sauvetage avant d’utiliser ce produit près de l’eau. Soyez prudent avec les lignes. • Ne touchez jamais les lignes lorsque le kite est en cours d’utilisation. Les lignes sont extrêmement dangereuses lorsqu’elles sont sous tensions et peuvent causer des blessures graves ou un décès. • Ne jamais utiliser ce produit avec des lignes usées. Une ligne qui casse sous tension peut causer des blessures graves ou un décès. • Vérifiez toujours les nœuds de vos lignes avant chaque utilisation. Les nœuds peuvent réduire considérablement la solidité des lignes. • Éloignez-vous des lignes emmêlées à moins que le kite soit fixé au sol. Un Kite non assuré peut s’envoler de façon inattendue, et peut causer des blessures graves ou un décès. • Ne jamais se mettre, ou que quelqu’un d’autre, ne se mettre entre la barre de commande et l’aile en utilisant ce produit. AJUSTEZ LA PUISSANCE DE VOTRE AILE AVEC LE TAQUET COINCEUR (CLAM CLEAT). En tirant sur la poignée noire pour raccourcir les lignes avant afin de réduire la puissance de l’aile. Relâchez la poignée noire vous donnera plus de puissance. GONFLAGE: • Toujours utiliser le lien de la pompe pour tenir votre aile pendant que vous gonflez. • Le système de pompe simple, est en série sur tous les kite RRD. • Pompez jusqu’à ce que l’aile soit très ferme et rigide (max 10 psi). • Fermez la valve de gonflage avec le Velcro. Après l’atterrissage et la sécurisation de votre aile, détachez vos lignes et enroulez-les. Laisser les lignes à terre peut être dangereux. NOTE: • Ne jamais stocker le kite quand celui ci est humide, cela entraine le risque de la décoloration de l’’aile. Cette décoloration ne sera pas couverte de garantie. • Faite sécher l’aile et enlever le maximum de sable avant de replier votre Kite. Attention le pliage correct de l’aile est très important pour préserver la vie de votre kite, avant de plier votre aile, assurez vous qu’elle soit propre et complètement sèche POUR PLIER L’AILE: 1) Ouvrir les deux valves sur le bord d’attaque, dégonfler et gonfler la valve pour entièrement enlever l’air du boudin principal; 2) Placer l’aile à plat sur le sol et aplatir le bord d’attaque; 3) Commencer le pliage par le bout de l’aile vers le centre en s’assurant que le bord d’attaque reste à plat; 4) Plier les deux côtés ensemble; 5) Plier l’aile en trois sections. COMMENT DÉGONFLER VOTRE AILE AVEC LE SYSTÈME SPS: Ouvrez la valve de dégonflage sur le bord d’attaque. C’est tout! NOTES SUR LE SOIN À DONNER AU KITE. Les poulies - Assurez-vous que toutes les poulies sont en bon état de fonctionnement avant chaque session. Rincez-les avec de l’eau douce après chaque session pour enlever le sable et les débris. Le Soleil - Le rayonnement ultraviolet est l’ennemi de tous les tissus. Votre aile durera longtemps, même dans les conditions de soleil extrêmes, mais il faudra prendre soin de ne pas la soumettre à des expositions inutiles. Par exemple, si vous avez plus d’un kite gréé sur la plage, mettez celles que vous n’utilisez pas à l’ombre. La chaleur - La pression des boudins augmente lorsque l’air à l’intérieur se réchauffe. Méfiez-vous des kite laissés sur les surfaces sombres (sable noir, de l’asphalte) car la pression dans les boudins peut causer des dommages à l’aile. Ne laissez pas les lattes complètement gonflées à l’intérieur d’une voiture chaude. Le sable - Essayez d’éviter d’avoir du sable dans les plis entre la structure gonflée et la toile. Le sable laissé agira comme une source constante d’abrasion. Rochers - Les rochers, le corail, les bâtons et les débris de plage sont d’autres dangers potentiels pour la perforation des boudins de n’importe quel kite. Les boudins - Eviter de mettre du sable et de l’eau à l’intérieur des boudins. Si vous dégonflez le kite dans l’eau, fermez ensuite les valves. StockageLa combinaison d’un kite stocké encore humide et de la chaleur peut causer des transferts de couleurs. Ne ranger votre aile que seulement après qu’elle soit complètement sèche. AVERTISSEMENT: CE PROBLÈME N’EST PAS COUVERT PAR LA GARANTIE. La pompe - Appliquer une pression uniforme sur les deux côtés de la poignée de la pompe pour diminuer la possibilité de la casser. Lancement - Faites preuve de prudence lorsque vous lancez vousmême dans des conditions venteuses, car cela met beaucoup de contraintes sur le bord d’attaque. Le bord d’attaque - Ne permettez pas au bord d’attaque de plier vers l’arrière. Faites attention lors de la manipulation sur la plage pendant le lancement ou l’atterrissage afin de garder la forme initiale en “C” du bord d’attaque. L’aile n’est pas conçue pour être recourbées vers l’arrière. Le redressage ou le pliage du bord d’attaque vers l’arrière met énormément de pression sur le tissu. Shore break - Même un petit shore break peut être brutal pour le kite. Non seulement le shore break transporte du sable dans chaque crevasse sur le kite, mais l’eau en mouvement peut déchirer la peau de l’aile. Divers - Les zones d’impact, Le ‘shore break’, les lignes électriques et les arbres sont même dangereux. UTILISATION CORRECTE DE LA VALVE GONFLAGE/ DÉGONFLAGE. Apres avoir gonfler correctement le kite s’assurer que la base de la valve est bien serrée. Couvrir systématiquement la valve avec le néoprène, en mode gonfler ou dégonfler. Ne jamais laisser la valve dévissée ou dépourvue de son capuchon néoprène, cela peux entrainer des dommages aux tissus et a la même valve. MONTAGE VALVE SPS. 1 - Retirer la valve de la cavité SPS en faisant attention de tenir en position le boudin a l’intérieur du BA. 2 - Tirer la valve vers l’extérieur afin d’encastrer parfaitement la base de la valve dans la cavité SPS. 3 - Enfiler le capuchon en silicone jaune sur le tube, en faisant attention que le tube arrive au fond du capuchon. 4 - Controller que le tube soit bien insérer dans le capuchon et mouillez le afin que celui glisse facilement sur la valve. 5 - Insérer le avec force de sorte que le tube s’insère sur la valve, attention le tube doit avancer avec le capuchon. 6 - Quand le capuchon est insérer, appuyer sur la valve afin que celle ci s’insère dans l’emplacement prévu. Ricci International Srl garantit a l’acheteur original que ce produit est exempt de défauts majeurs dans les matériaux ou d’une erreur de contenu du colis, pour une période de douze (12) mois (24 UE) à partir de la date d’achat. Cette garantie est sujette aux restrictions suivantes. ce produit. Cette garantie ne couvre pas les dommages causés par une utilisation abusive, négligence ou usure normale, y compris, mais sans se limiter, aux crevaisons, au gréement avec d’autres composants de International Srl Ricci, les dommages dus à une exposition excessive au soleil, ou des dommages en raison du sur gonflage des boudins, les dommages causés par une manipulation et un stockage inadaptés, les dommages causés par l’usage dans les vagues ou le shore break, et les dommages causés par autre chose que des vices des matériaux et de fabrication. Cette garantie est annulée si des réparations non autorisées, des changements ou des modifications ont été faites sur une partie de l’équipement. La garantie pour tout équipement réparé ou remplacé est valable à partir de la date d’achat originale. La facture d’origine doit accompagner toute réclamation. Le nom du détaillant et la date d’achat doivent être clairs et lisibles. Il n’y a pas de garanties, qui s’étendent audelà de la garantie spécifiée ici. Les réclamations de garantie. Les réclamations de garantie doivent être traitées et une autorisation de retour délivrée avant l’expédition à RRD International Srl. Merci d’appeler ou d’écrire pour le traitement des réclamations au distributeur national de Ricci International Srl et/ou de transmettre à Ricci International Srl. à demander à un distributeur local. WIR DANKEN IHNEN FÜR DEN KAUF IHRES NEUEN RRD KITES. Sie haben sich für den Kauf eines fantastischen Kites entschieden, der Dank des unverwechselbaren RRD Design Teams die neusten Ausstattungsmerkmalen besitzt und für ultimative Performance sorgt! Bitte lesen Sie dieses Benutzerhandbuch gründlich, bevor Sie diesen Kite das erste Mal verwenden. Dieses Benutzerhandbuch soll Ihnen alles Wichtige über Ihren neuen RRD Kite beibringen und liefert Ihnen Informationen über den richtigen Aufbau, das Tuning und die Pflege und Wartung Ihres Kites und seiner Komponenten. HAFTUNGSAUSSCHLUSS UND EINWILLIGUNG. Zuweisung der Verantwortung, Ablehnung von Ansprüchen und bewusste Inkaufnahme des Risikos. MIT DEM AUFBAU DIESES PRODUKTS VERPFLICHTEN SIE SICH DIE FOLGENDEN PUNKE ZU AKZEPTIEREN: Als erstes befolgen Sie sorgfältig alle unten aufgeführten Bedingungen und Konditionen und zweitens weisen Sie jeden, der dieses Produkt benutzen wird, darauf hin, diese Bedingungen zu beachten. Sollten Sie sich nicht verpflichten wollen, diese Bedingungen zu beachten, bringen Sie dieses Produkt unbenutzt zurück und Sie erhalten Ihr Geld dafür umgehend wieder. Sie erhalten eine Rückzahlung ausschließlich, wenn dieses Produkt nicht benutzt wurde. INKAUFNAHME DES RISIKOS. Die Benutzung dieses Produkts und seiner Komponenten bringt das Risiko mit sich, dass Sie sich damit schwer verletzen oder zu Tode kommen können. Wenn Sie dieses Produkt benutzen, willigen Sie freiwillig ein, alle bekannten und unbekannten Risiken in Kauf zu nehmen, die mit der Nutzung dieses Produktes verbunden sind. Die mit dieser Sportart verbundenen Risiken lassen sich deutlich reduzieren, wenn Sie sich an die Warnungen und Richtlinien dieses Benutzerhandbuchs halten und Ihren gesunden Menschenverstand benutzen. HAFTUNGSAUSSCHLUSS UND EINWILLIGUNG AUF JEGLICHE ANSPRÜCHE ZU VERZICHTEN. Durch den Kauf des RRD Produkts akzeptieren Sie die folgenden Punkte in vollem Umfang entsprechend geltenden Rechts. • Sie verzichten heute und in Zukunft auf alle und jegliche Ansprüche gegen Ricci International Srl, seine Händler und alle beteiligten Unternehmen, die durch die Benutzung des Produkts und jegliche seiner Komponenten entstehen. • Unter keinen Umständen sind Ricci International Srl, seine Händler und alle beteiligten Unternehmen verantwortlich oder haftbar für Verlust, Schäden, auch von untergeordneter Bedeutung, Folgeschäden, Schäden, die durch den Verstoß gegen gesetzliche Vorschriften entstehen, exemplarische oder vertragliche Schäden, Verletzungen oder Kosten, die Ihnen oder anderen Benutzern dieses RRD Produkts entstehen. Dies gilt auch für alle Verluste, die Ihren Angehörigen dadurch entstehen, dass Sie das RRD Produkt benutzen. Hierbei ist es völlig unerheblich, wie diese Verluste entstanden sind und ob Fahrlässigkeit oder Vertragsbruch auf Seiten von RRD und allen beteiligten Unternehmen in Bezug auf Design und Herstellung des RRD Produkts und jegliche seiner Komponenten vorliegt. Sollten Sie zu Tode kommen oder handlungsunfähig werden, gelten alle genannten Vorschriften bindend für Ihre Erben, Angehörigen, Testamentsvollstrecker, Nachlassverwalter, Bevollmächtigte und Repräsentanten. Kein Unternehmen, welches mit RRD in Verbindung steht, macht jemals Zusicherungen in mündlicher oder schriftlicher Form, die von den hier genannten Bestimmungen und dem RRD Benutzerhandbuch abweichen. INKAUFNAHME DES RISIKOS: Die Benutzung dieses Produkts und jeglicher seiner Komponenten bringen gewisse unvermeidliche und unvorhersehbare Risiken und Gefahren mit sich, die dazu führen können, dass Sie sich damit schwer verletzen oder zu Tode kommen können. Diese Risiken gelten sowohl für Sie als Benutzer, als auch für Dritte. Wenn Sie dieses Produkt benutzen, verpflichten Sie sich, alle bekannten und unbekannten Verletzungsrisiken, die mit der Nutzung dieses Produktes verbunden sind, und ihnen oder auch Dritten wiederfahren könnten, in Kauf zu nehmen. Die mit dieser Sportart verbundenen Risiken lassen sich deutlich reduzieren, wenn Sie sich an die Warnungen und Richtlinien dieses Benutzerhandbuchs halten und Ihren gesunden Menschenverstand benutzen. H A F T UNG SBEFREIUNG UND ANSPRUCHSVERZICHT. Durch den Kauf des RRD Produkts akzeptieren Sie die folgenden Punkte in vollem Umfang: • Sie verzichten heute und in Zukunft ausdrücklich auf alle und jegliche Ansprüche gegen Ricci International Srl, die durch die Benutzung des Produkts und seiner Komponenten und aller und jeglicher dadurch entstehenden Schäden entstehen könnten. • Unter keinen Umständen ist Ricci International Srl verantwortlich oder haftbar für Verlust, Schäden, Verletzungen oder Kosten, die Ihnen oder anderen Benutzern dieses RRD Produkts oder seiner Komponenten entstehen. Dies gilt auch für alle Verluste, die Ihren Angehörigen dadurch entstehen, dass Sie das RRD Produkt benutzen. Hierbei ist es völlig unerheblich, wie diese Verluste entstanden sind und ob Fahrlässigkeit oder Vertragsbruch auf Seiten von RRD und allen beteiligten Unternehmen in Bezug auf Design und Herstellung des RRD Produkts und jegliche seiner Komponenten vorliegt. Sollten Sie zu Tode kommen oder handlungsunfähig werden, gelten alle genannten Vorschriften bindend. LESEN SIE DIE FOLGENDEN PUNKTE BEVOR SIE IHREN NEUEN RRD KITE AUFBAUEN. Warnungen: •	Das Fliegen eines Kites kann gefährlich sein. •	Benutzen Sie dieses Produkt nur unter größter Vorsicht. •	Die falsche Anwendung dieses Produkts kann zu gefährlichen Verletzungen oder zum Tod führen. •	Benutzen Sie dieses Produkt nur, wenn Sie in guter körperlicher Verfassung sind. •	Dieser Kite dient nicht als Ihre persönliche Auftriebshilfe. Verwenden Sie dieses Produkt niemals auf leichtsinnige Art und Weise (springen Sie damit z.B. nicht in die Luft oder verbinden sich niemals unlösbar mit dem Produkt oder festen Anlagen). Sie sind selbst verantwortlich für Ihre Sicherheit und die Sicherheit anderer in Ihrer Nähe, wenn Sie dieses Produkt verwenden. gesicherter Kite ist sehr gefährlich für Personen, die sich in Lee von diesem Kite befinden. • Ein Leashsystem verbindet Sie nicht permanent mit diesem Produkt. Verbinden Sie sich niemals permanent mit dem Kite oder seinen Komponenten. • Tragen Sie immer einen Helm, Handschuhe, Schuhe und eine Schutzbrille, wenn Sie dieses Produkt verwenden. • Tragen Sie immer ein qualitativ hochwertiges, kitespezifisches Trapez. • Nehmen Sie Unterricht in einer anerkannten Schule, bevor Sie dieses Produkt verwenden. Fliegen Sie niemals einen Kite ohne zuvor von einem Kitelehrer geschult worden zu sein. • Machen Sie sich bewusst, wie Ihr Quick Release System funktioniert, indem Sie dieses in einem gefahrlosen Moment auslösen. • Spülen Sie folgende Komponenten nach jeder Session mit Süßwasser ab: 1) Quick Release Systeme; 2) Depower-Trimmschlaufe; 3) Sicherheits/Safety Leash; 4) Leash System. Quick Release Komponenten haben eine begrenzte Lebensdauer und müssen nach jeder Kite Session überprüft und sofort ausgetauscht werden, wenn sich erste Abnutzungserscheinungen zeigen, denn nur dann ist höchste Effizienz des Materials gewährleistet. • Das Quick Release, die Trimmschlaufe und die Leash des Quick Release Systems müssen nach 250 Kitestunden ausgetauscht werden. Nehmen Sie jedoch jeder Zeit einen Austausch vor, wenn sich Abnutzungserscheinungen zeigen. Der Verschleiß Ihres Quick Release Systems fällt nicht unter die Gewährleistung. Wählen Sie sichere Witterungsbedingungen aus: •	Never learn to use this product in more than 10 knots of wind. •	Never use this product in high or gusty winds. •	Never use this product in thunderstorm and lightning conditions. •	Only use this product when you can remain in a standing position. •	Never use this product in wind conditions that are beyond your ability level. •	Never use this product near or on the water in offshore wind conditions unless you are an expert swimmer. Sie nicht schwimmen können oder nicht in guter körperlicher Verfassung sind. •	Üben Sie sowohl Starten und Landen als auch Selbstrettungstechniken, bevor Sie dieses Produkt in der Nähe des Wassers verwenden. GEHEN SIE BESONDERS VORSICHTIG MIT DEN FLUGLEINEN UM: •	Berühren Sie niemals die Flugleinen, wenn Sie den Kite benutzen. Wenn sich Zug auf den Flugleinen befindet, sind diese extrem gefährlich und können ernsthafte Verletzungen oder Tod verursachen. •	Benutzen Sie dieses Produkt niemals mit abgenutzten Flugleinen. Wenn eine Leine unter Spannung reißt, kann dies zu ernsthaften Verletzungen oder zum Tode führen. •	Überprüfen Sie, dass sich keine Knoten auf den Leinen befinden, bevor Sie diese benutzen. Knoten wirken sich sehr negativ auf die Haltbarkeit der Leinen aus. •	Halten Sie sich von verknoteten Flugleinen fern, bis sich der Kite gesichert am Boden befindet. Ein ungesicherter Kite kann unerwartet von alleine starten und so zu ernsthaften Verletzungen oder zum Tode führen. •	Achten Sie darauf, dass weder Sie, noch eine andere Person zwischen Barsystem und Kite geraten, wenn Sie dieses Produkt verwenden. STELLEN SIE DIE POWER IHRES KITES MIT DER BELEGKLEMME EIN. Wenn Sie den schwarzen Griff nach unten ziehen, verkürzen Sie damit die Depowerleinen Ihres Kites, so dass der Kite weniger Power hat. Durch lösen des schwarzen Griffs erhöhen Sie die Power Ihres Kites. AUFPUMPEN: • Benutzen Sie immer die Leash Ihrer Pumpe während Sie den Kite aufpumpen. •	Alle RRD Kites sind mit dem SPS Single Pump System ausgestattet. •	Pumpen Sie solange, bis der Kite ein festes und starres Profil erhält (maximal 10 psi). •	Schließen Sie das Einlassventil mit dem Klettverschluss. SO LÄSST MAN DIE LUFT AUS DEM KITE MIT SPS SYSTEM: Öffnen Sie das große Auslassventil (DUMP) auf der Fronttube. Das ist schon alles!!! Kitetubes lassen, schließen Sie umgehend danach die Ventile. Lagerung - Sollten Sie Ihren Kite zusammenrollen, während dieser noch nass und warm ist, kann dies dazu führen, dass die Farben des Tuches abfärben. Packen Sie Ihren Kite nur zusammen, wenn er komplett getrocknet ist. WARNUNG: EIN ABFÄRBEN DES KITETUCHS FÄLLT NICHT UNTER DIE GEWÄHRLEISTUNG Pumpe- Halten Sie den Griff der Pumpe mit beiden Händen gleichmäßig fest während Sie pumpen. Damit mindern Sie die Bruchgefahr des Griffs. Self-launch - (ohne Starthelfer starten) – Besondere Vorsicht ist geboten, wenn Sie bei viel Wind einen Self Launch ohne Starthelfer durchführen wollen, denn unter solchen Bedingungen wird die Fronttube stark beansprucht. Fronttube - Sorgen Sie dafür, dass sich die Fronttube nicht rückwärts durchbiegt. Gehen Sie besonders vorsichtig mit dem Kite um, während dieser am Strand gestartet oder gelandet wird und achten Sie darauf, dass der Kite dabei immer sein korrektes “C“ Shape behält. Shore break - Sogar ein kleiner Shore Brake kann dem Kite großen Schaden zufügen. Durch den Shorebrake wird Sand in alle Bereiche des Kites gespült und die über den Kite schwappenden Wassermassen können das Kitetuch beschädigen. Diverse - Aufprallzonen, Shore Brake, Hochspannungsleitungen und Bäume können beim Kiten eine große Gefahr für Sie bedeuten. DER RICHTIGE UMGANG MIT DEM VENTIL AUFBLASEN / ENTLEEREN Verschließen Sie das Ventil nach dem Aufpumpen sorgfältig. Schließen Sie nach dem Aufpumpen stets die Ventilabdeckung. Schließen Sie stets nach Gebrauch das Ventil und die Ventilabdeckung um Schäden zu vermeiden. SPS /SINGLE PUMP SYSTEM CONNECTION. 1 - Ziehen Sie die transparente Verbindung durch das dafür vorgesehene Loch in der Tube und vergewissern Sie sich, dass die Bladder in der Leading Edge (oder Strut) sich in der Richtigen Position befinden, vermeiden Sie dabei Verdrehungen. 2 - Ziehen Sie die transparente Verbindung nach außen, bis dessen Sockel perfekt in der SPS –Öffnung sitzt (siehe Bild). 3 - Platzieren Sie die gelbe, weiche Gummikappe um den weichen Gummischlauch. Vergewissern Sie sich, dass der Schlauch die korrekte Position (siehe Bild) hat. 4 - Um den Schlauch mit der transparenten Verbindung leichter koppeln zu können, können Sie auch einen Tropfen Wasser in die Schlauchöffnung geben. Achten Sie beim Verbinden des Schlauchs mit der transparenten Verbindung darauf, dass diese bis zum Ende in den Schlauch geschoben wird und stabil sitzt. 5 - Drücken Sie den Schlauch mit der gelben Kappe fest auf die Verbindung. Achten Sie darauf, dass der Schlauch nicht zurück rutscht. Ricci International Srl gewährleistet dem Ersterwerber dieses Produkts für einen Zeitraum von zwölf (12) Monaten (24 Monaten in der EU) vom ursprünglichen Kaufdatum an, dass dieses Produkt keine schwer wiegenden Material- und Verarbeitungsfehler aufweist. Für diese Gewährleistung gelten folgende Einschränkungen Die Gewährleistung gilt nur, wenn der original Kaufbeleg oder Kassenbon, der das genaue Kaufdatum des Produkts vorweist, vorhanden ist. Es besteht nur Anspruch auf Gewährleistung, wenn das Produkt zum Kiteboarden auf dem Wasser eingesetzt wird und es besteht kein Anspruch auf Gewährleistung, wenn das Produkt für Verleih oder Schulung verwendet wird. Ricci International Srl benötigt die folgenden Informationen, um zu entscheiden ob ein berechtigter Gewährleistungsanspruch besteht: • Produktfotos, auf dem der Schaden deutlich erkennbar sein muss; • Ein Foto der Seriennummer des betroffenen Kites; • Eine Kopie des Kaufbelegs oder Kassenbons. Bitte lassen Sie die oben genannten Informationen Ihrem Händler zukommen und dieser leitet die Informationen dann an Ricci International weiter. Direkte Anfragen sind nicht gestattet. Produkte können nur zurückgeschickt werden, wenn zuvor eine “Return Authorisation Number” (RA) beim Ricci International Srl Importeur angefordert wurde. Diese RA Nummer muss sich deutlich lesbar auf der Außenseite des verpackten Produkts befinden, Rücksendungen ohne diese Nummer werden nicht angenommen. Wird Ihr Gewährleistungsanspruch für das defekte Produkt von Ricci International Srl anerkannt, haben Sie nur Anspruch auf Reparatur oder Austausch des defekten Produkts. Ricci International Srl ist jedoch nicht verantwortlich für sämtliche Kosten, Verluste oder Schäden, die durch den Verlust dieses Produkts entstehen. Ebenfalls besteht kein Anspruch auf Gewährleitung für jegliche Schäden, die durch falschen Gebrauch, Missbrauch, und unbefugte Veränderungen entstehen. Für normale Verschleißerscheinungen gilt auch kein Ersatz- oder Reparaturanspruch. Weiterhin besteht kein Gewährleistungsanspruch für Schäden, die durch Aufprall entstehen oder wenn das Ricci International Srl Produkt mit Materialkomponenten anderer Hersteller aufgebaut wird. Auch sind Schäden, die durch exzessive Sonneneinstrahlung, übertrieben starkes Aufpumpen der Bladders, unsachgemäße Handhabung oder Lagerung, Anwendung in Riffbrandung und Shorebrake und alle Schäden, die nicht durch Material- und Verarbeitungsfehler entstanden sind, von dieser Gewährleistung ausgeschlossen. Der Gewährleistungsanspruch erlischt durch unbefugte Reparaturen oder Veränderungen des Produkts oder einer Produktkomponente. Der Gewährleistungsanspruch für reparierte oder ausgetauschte Produkte gilt nur vom ursprünglichen Kaufdatum an. Der original Kaufbeleg muss allen Reklamationen beigelegt werden. Auf diesem original Kaufbeleg muss der Name des Händlers und das Kaufdatum deutlich lesbar sein. Ist der genannte Gewährleistungszeitraum abgelaufen, erlischt der Anspruch auf Gewährleistung. Gewährleistungsanfragen. Alle Gewährleistungsanfragen müssen bevor Sie an RRD International Srl geschickt werden erst autorisiert werden (mit einer Return Authorization Nummer versehen werden). Bitte kontaktieren Sie für alle Gewährleistungsanfragen zuerst Ihren Ricci International Importeur (schriftlich oder per Telefon), der dann Ihr Anliegen an Ricci International Srl weiterleitet. von Ihrem Importeur zu erfragen. GRAZIE PER AVER ACQUISTATO UN NUOVO KITE RRD. 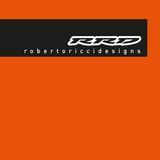 Avete scelto un nuovo kite con la qualità e le performance migliori, caratterizzato dall’ inconfondibile design rrd!!! Prima di utilizzarlo leggete attentamente questo manuale per prendere conoscenza di tutte le peculiarità tecniche dei kite rrd ed effettuarne un montaggio corretto. Se volete essere sicuri di divertirvi e sfruttare al 100% le prestazioni del vostro kite aumentandone la durata nel tempo, seguite i consigli e le precauzioni sulla sicurezza riportati in questa utile guida. ESENZIONE ED ACCETTAZIONE. Cessione di responsabilità, rinuncia al reclamo e consapevolezza dell’assunzione del rischio. ASSEMBLANDO QUESTO PRODOTTO, CI SI IMPEGNA A: Prima di tutto ad attenersi scrupolosamente ai termini e condizioni in seguito riportate in secondo luogo a richiedere che chiunque utilizzi questo prodotto si attenga a tali condizioni. Se non si intende attenersi a tali termini, si può riconsegnare il prodotto (non usato) e richiedere il rimborso totale, che verrà effettuato solo nel caso in cui il prodotto non sia mai stato utilizzato. ASSUNZIONE DEL RISCHIO. L’uso di questo prodotto e di ogni suo componente, comporta alcuni rischi e pericoli da cui possono derivare seri danni personali inclusa la morte. Nell’utilizzare il prodotto si accetta liberamente ogni rischio, conosciuto/ sconosciuto di danni eventuali derivanti dall’uso di tale attrezzatura. I rischi correlati alla pratica di questo sport possono essere fortemente ridotti attenendosi agli Avvertimenti e alle linee guida elencati in questo manuale dell’utente e facendo ricorso alle regole che spesso sono riconducibili al comune buon senso. agenti, provenienti dall’uso di questo prodotto e ogni suo componente. • In nessun caso Ricci International Srl e ognuno dei suoi agenti, può essere responsabile di danni particolari, indiretti, casuali, conseguenti, regolamentari o esemplari, ovvero contrattuali, per illecito civile, negligenza, precisa responsabilità o altri danni, inclusi perdite di altre proprietà oltre alla perdita di questo prodotto, perdita della possibilità di utilizzare il sopraccitato prodotto, o altre perdite di proprietà o economiche, senza alcuna limitazione derivanti dall’utilizzo proprio o improprio o rotture e malfunzionamenti nel design e nella manifattura. Ricci International Srl e ognuno dei suoi agenti non può essere soggetta a richiesta di contributi o indennizzo, qualunque sia la causa. RILASCIO E RINUNCIA DEI RECLAMI. L’utilizzo di questo prodotto rrd può esporre l’utente a rischi, pericoli e danni ineluttabili ed imprevedibili che possono provocare ferite personali e morte sia all’utente che a terzi. Utilizzando questo prodotto, acconsentite liberamente ed accettate tutti i rischi conosciuti e sconosciuti di lesioni a voi ed a terzi che possono derivare dall’utilizzo di questa attrezzatura. Quella del kitesurf è un’attività rischiosa e l’utilizzo di attrezzatura da kitesurf comporta il rischio di seri infortuni personali in ogni parte del corpo dell’utente o addirittura la morte. I rischi inerenti la pratica di questo sport possono essere notevolmente ridotti attenendosi scrupolosamente a quanto riportato in questi manuale ed usando una giusta dose di buonsenso. Con l’acquisto e l’utilizzo di questo prodotto rrd, date il vostro più completo consenso ai seguenti punti: • Rinuncia esplicita a tutti i reclami che abbiate o possiate in avere contro Ricci International Srl e tutti i possibili danni derivati dall’uso del prodotto a marchio rrd e relativi componenti. • In nessun caso la Ricci International Srl potrà essere ritenuta responsabile di qualsiasi perdita, danno, ferita o spesa che l’acquirente o qualsiasi utente che utilizzi il prodotto di marchio rrd può subire, come conseguenza dell’uso del prodotto di marchio rrd. Per qualunque causa, compresi negligenza o difetto di fabbricazione del prodotto di marchio rrd e dei relativi componenti. In caso di morte o incapacità di intendere o volere derivante dall’utilizzo di questo prodotto, avranno valore giuridico tutte le disposizioni riportate in questo manuale. LEGGERE I SEGUENTI PUNTI PRIMA DI ASSEMBLARE IL PROPRIO KITE. Avvertimenti: • Il kite in volo può essere pericoloso. • Usare sempre la massima prudenza nell’utilizzo di questo prodotto. • L’uso non appropriato di questo prodotto può essere causa di gravi danni o di morte. • Usare questo prodotto solo se si gode di buona salute. • Il proprio kite non è un personale mezzo di navigazione. Non comportarsi in maniera negligente mentre si utilizza questo prodotto, evitare di legarsi ad oggetti e strutture a terra ed evitare di saltare mentre ci si trova ancora a terra. • L’utente è responsabile della propria e altrui incolumità e sicurezza mentre utilizza questo prodotto. IMPORTANTI NORME DI SICUREZZA. • Il proprio kite non è un mezzo personale di navigazione. • Indossare sempre un giubbetto salvagente approvato dalla Guardia Costiera quando si è in navigazione o si usa questo prodotto in prossimità di specchi d’acqua. • Avvalersi sempre della collaborazione di un compagno nelle fasi di lancio e atterraggio del kite. • Prima di iniziare ad utilizzare questo prodotto rrd, esercitarsi utilizzando un kite piccolo a 2 cavi (di superficie uguale o inferiore a un metro). • Non permettere mai a chi non sia pratico dell’utilizzo del kite di usare il prodotto senza l’assistenza di un esperto. • Non utilizzare mai questo prodotto senza il leash system. Un kite perso è estremamente pericoloso per chiunque si trovi sottovento. • Il leash system non è un accessorio fisso di questo prodotto. Evitare di legarsi al kite in maniera permanente. • Indossare sempre un casco, guanti, stivaletti e occhiali protettivi quando si utilizza questo prodotto. • Indossare sempre un trapezio specifico per la pratica del kitesurf. • Prima di utilizzare il kite è opportuno seguire un idoneo corso preliminare presso una scuola certificata. Evitate l’apprendimento da autodidatta: le lezioni di un istruttore professionale e qualificato vi aiuteranno ad evitare pericolosi rischi e ad apprendere la pratica sicura dello sport in tempi molto più rapidi. • Cercate di imparare a padroneggiare bene il funzionamento dei sistemi di sicurezza provandoli in situazioni di NON emergenza per essere preparati ad ogni eventualità. • Al termine di ogni uscita provvedete sempre a risciacquare i seguenti sistemi: 1) quick release; 2) de-power trim loop; 3) cavo di sicurezza; 4) leash system con acqua dolce. Tutti questi sistemi sono soggetti ad usura e deterioramento, pertanto vanno controllati al termine di ogni uscita e sostituiti non appena si notino i primi segnali di invecchiamento ed usura per garantirne sempre la massima efficienza. • Il sistema di de-power e il security leash system devono comunque essere sostituiti dopo 250 ore di navigazione. Il de-power trim loop ed il security leash system sono componenti non considerati in garanzia. SCELTA DELLE CONDIZIONI METEO SICURE. •	Non imparare mai ad usare questo prodotto con più di dieci nodi di vento. •	Non utilizzare mai questo prodotto con vento forte e/o rafficato. •	Non utilizzare mai questo prodotto con temporali in arrivo e possibilità di caduta di fulmini. •	Usare questo prodotto solo quando si può rimanere in posizione eretta senza l’aiuto di qualcuno. •	Non utilizzare mai questo prodotto quando le condizioni meteo sono al di sopra del proprio livello di abilità. •	Non utilizzare mai questo prodotto in condizione di vento da terra. procedure di lancio e atterraggio nonché le tecniche di auto salvataggio facendo pratica con vento leggero. PRUDENZA CON LE LINEE. •	Non toccare mai le linee quando il kite è in uso. Le linee in tensione sono estremamente taglienti e possono causare seri danni o la morte. •	Non utilizzare mai questo prodotto con le linee usurate. Una linea che si strappa mentre è in tensione può causare seri danni o la morte. •	Prima di ogni utilizzo controllare sempre che le linee non presentino nodi o sfilacciamenti. I nodi riducono fortemente la resistenza alla trazione delle linee. •	Allontanarsi da linee aggrovigliate a meno che il kite sia posizionato a terra in maniera sicura. Un kite non posizionato correttamente a terra può sollevarsi da solo inaspettatamente e può causare seri danni o la morte. •	Evitare che chiunque possa trovarsi tra la barra di controllo e il kite mentre si usa questo prodotto. MODIFICARE LA POTENZA DEL KITE CON IL CLAM CLEAT. Il Clam Cleat è un sistema molto efficiente che ci permette di gestire la potenza del kite con estrema precisione. Quando la maniglia nera si trova sul Clam Cleat (strozza scotte) il kite genera la massima potenza. Tirando la maniglia nera le linee frontali si accorciano ed otterremo meno potenza. GONFIAGGIO: •	Fissate sempre il kite al leash della pompa durante il gonfiaggio. •	I kite rrd sono tutti dotati di del sistema Single Pump System. •	Gonfiatelo bene fino a sentirlo bene rigido strutturalmente (max 10 psi). •	Coprire la valvola con il Velcro di sicurezza. Dopo averlo fatto atterrare ed assicurato, distaccate le linee e avvolgetele alla barra. Lasciare le linee attaccate può sempre causare pericolo. NOTA: • Mai riporre il kite nella sacca se ancora umido. Il colore del kite potrebbe mutare e fare variare il colore del materiale con cui è costruito il Kite stesso. Nel caso in cui il colore dei kite subisca qualsiasi variazione, il kite non sarà coperto da garanzia, dal momento che questa problematica è dovuta a negligenza. • Fate asciugare il kite e rimuovete l’eccesso di sabbia prima di riporlo. Ripiegare accuratamente il proprio kite è molto importante per allungare la vita del kite stesso e per prevenire twist del bladder della leading edge. Prima di riporre il vostro kite, fatelo asciugare completamente. COME RIPIEGARLO: 1) Sgonfiate tutti I bladder; 2) Aprite la valvola “dump valve” posta sulla leading edge, per togliere tutta l’aria; 3) Con il kite disteso a terra verificate che tutta l’aria sia fuoriuscita; 4) Ripiegatelo partendo dai tips verso il centro, mantenendo la leading edge piatta; 5) Ripiegate le due parti fino al centro; 6) Piegatelo in tre parti. COME SGONFIARE IL KITE CON SISTEMA SPS: Aprite la valvole grande di sgonfiaggio “dump valve” e il gioco è fatto!!! PRESSIONE DI GONFIAGGIO: •	Ricordate che la pressione è molto importante, quindi gonfiatelo sempre ben rigido (max 10 psi). •Non lasciate mai il kite esposto al sole. •Non lasciate mai il leading edge gonfia su superfici calde. PREVENZIONE DI USURA DEL KITE. Pulegge - Accertatevi che le puleggie siano sempre efficienti, risciacquatele spesso con acqua ed eliminate sabbia o detriti. Sole - Il grande nemico del tessuto sono i raggi ultravioletti. Il kite può vivere a lungo anche nelle condizioni più difficili sotto il sole, ma non lasciate mai il kite inutilizzato sotto il sole a lungo. Se potete, tenete il kite in una zona ombreggiata. Caldo - La pressione nei bladder aumenta quando l’aria si surriscalda. Non lasciate mai il kite su superfici scure (sabbia o asfalto) non lasciate mai il kite in auto con i bladder gonfi. Sabbia - Cercate di mantenere sempre pulito dalla sabbia la parte della leading edge a contatto con il tessuto, la sabbia potrebbe causare abrasioni importanti. Roccia - Rocce, coralli, oggetti contundenti potrebbero essere letali per il vostro kite. Fate sempre attenzione. Bladder - Fate attenzione a non fare entrare sabbia o acqua all’interno dei bladder (Camere d’aria). Se sgonfiate il kite in acqua, richiudete le valvole non appena avete finito. Rimessaggio - Ricordatevi di non lasciare a lungo ripiegato il vostro kite se è bagnato o umido, riponetelo nella sacca solo quando è completamente asciutto. Il kite bagnato e ripiegato può causare danni ai colori del tessuto. NB: QUESTO DANNO NON È RICONOSCIUTO ALL’INTERNO DELLA GARANZIA. Pompa- Cercate di utilizzare la pompa sempre con la pressione sul manico al centro o con entrambe le mani, onde evitare di rompere la parte superiore. Rilancio solitario - Fate molta attenzione quando rilanciate il kite da soli, quando il vento è forte la leading edge è molto “stressata”. Leading edge - Non causate mai una ripartenza con la leading edge rovesciata, casomai dovesse accadere accidentalmente, rilasciate la barra immediatamente. Durante la partenza o l’atterraggio la forma a C della leading edge deve essere mantenuta tale. Onde di risacca- Ricordate che le piccole onde di risacca possono essere fatali al vostro kite. Se dovesse cadere sul bagnasciuga può entrare sabbia ovunque e la pressione dell’acqua può causare la rottura del tessuto. Se dovesse entrare sabbia fra la leading edge ed il tessuto, lavatelo con cura prima di utilizzarlo. Varie - Ricordate di rimanere sempre lontani da alberi, linee elettriche, zone pericolose e onde di risacca, questi sono dei veri pericoli per il voi ed il vostro kite. CORRETTO UTILIZZO DELLA VALVOLA INFLATE/ DEFLATE. Dopo aver gonfiato il kite, assicurarsi che la base della valvola sia ben serrata. Coprire sempre la valvola sia quando il kite è gonfio sia quando è sgonfio e ripiegato. Quando il kite è ripiegato non lasciare mai la valvola svitata e senza copertura. Questo causa danni alla valvola stessa e al tessuto. MONTAGGIO SPS VALVOLA. 1 - Estrarre la valvola dal foro SPS avendo cura di tenere in posizione il blader allâ&#x20AC;&#x2122;interno del LE. 2 - Tirare la valvola verso lâ&#x20AC;&#x2122;esterno fino a far incastrare perfettamente la base della valvola nel foro SPS. 3 - Calzare il cappuccio in silicone giallo sul tubo, avendo cura di controllare che tubo arrivi fino in fondo al cappuccio. 4 - Controllate che il tubo sia stato ben inserito nel cappuccio e bagnarlo leggermente in modo che questâ&#x20AC;&#x2122;ultimo possa scivolare facilmente sulla pipetta della valvola. 5 - Spingere con forza facendo calzare il tubo sulla valvola avendo cura che il tubo avanzi insieme al cappuccio. 6 - Una volta inserito il cappuccio schiacciare sulla valvola in modo che aderisca nellâ&#x20AC;&#x2122;apposito incastro. Ricci International Srl garantisce questo prodotto desente da difetti maggiori sia del materiale che nella manodopera all’acquirente originale per un periodo di 6 mesi dalla data dell’acquisto. come risultato di un uso dannoso di questo prodotto. Questa garanzia non copre danneggiamenti dovuti al cattivo uso, abuso, trascuratezza o semplice consumo e strappo, includendo, ma non limitando a forature e/o rotture dovute all’uso dell’attrezzatura con altri componenti estranei a Ricci International Srl, danneggiamento dovuto ad un’eccessiva esposizione al sole, danneggiamento dovuto ad un eccessivo gonfiaggio dei bladders, danneggiamento causato da un improprio trattamento e immagazzinamento, danneggiamento dovuto all’uso nelle onde o shore break, danneggiamento causato dalla caduta del kite ad alta velocità e danneggiamento causato da qualsiasi cosa diversa dal difetto di materiale e manifattura. Questa garanzia è annullata in caso di presenza di qualsiasi riparazione non autorizzata o cambiamento o modifica eseguita in qualsiasi parte dell’attrezzatura. La garanzia per ogni riparazione o sostituzione dell’attrezzatura è valida solo dalla data dell’acquisto originale. Gli scontrini degli acquisti originali devono accompagnare tutti i reclami di garanzia. Il nome del dettagliante e la data dell’acquisto devono essere chiari e leggibili ed il coupon di garanzia deve accompagnare ogni richiesta. Non si prevedono altre garanzie che si estendono oltre la garanzia specificata nella presente. Tutte le richieste di garanzia devo essere presentate al dettagliante o distributore internazionale e quindi inoltrate alla Ricci International Srl. CEDOLINO DA SPEDIRE CON IL KITE IN CASO DI GARANZIA. al reso da richiedere al distrubutore.